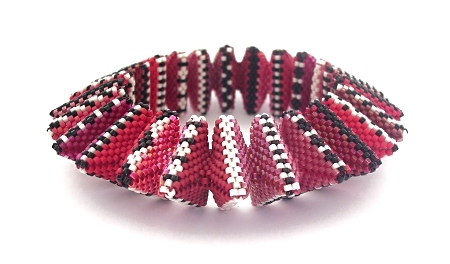 This slip on bracelet forms part of my Geometric Beadwork Series and after beading some pentagon shaped bracelets I decided to move onto triangles, and very soon my love affair with the shape was born. Triangles are 'easier' to bead than pentagons (which have a complicated stitch path which took me quite a while to figure out) and can be beaded a lot quicker- which always appeals! Because of their relative speed and ease of beading, I find that this is now the shape I return to time and time again. Always as I'm beading one piece, my mind is 2 or 3 pieces ahead, planning the next designs and styles, I just wish I had the time to bead them all! Before I began beading this piece I'd been working on lots of more neutral, plain colour pieces and wanted to inject some pattern and colour into my work. I was partly influenced by my Triangular Necklaces and partly by the checkerboard pattern I love, especially when mixed with colours. Once this bracelet was finished I realised that the triangle shape added another dimension to the style which wasn't apparent when beaded using pentagons. Playing around with the finished piece and rotating it in your hand is not only tactile, but very mesmerising! After beading this piece, and visiting the Milwaukee Art Museum, I took the same style of bracelet in another direction. Instructions for this item are available to purchase here. Update January 2008- This bracelet has been juried into the 2008 Wearable Expressions Exhibiton in Palos Verde, California. Update July 2007- this bracelet won 2nd place in the bracelet category of the 2007 Bead Art Awards. It also was juried as a finalist in the 2007 Bead Dreams Contest.